With nothing but the wide blue sky stretching in each direction. 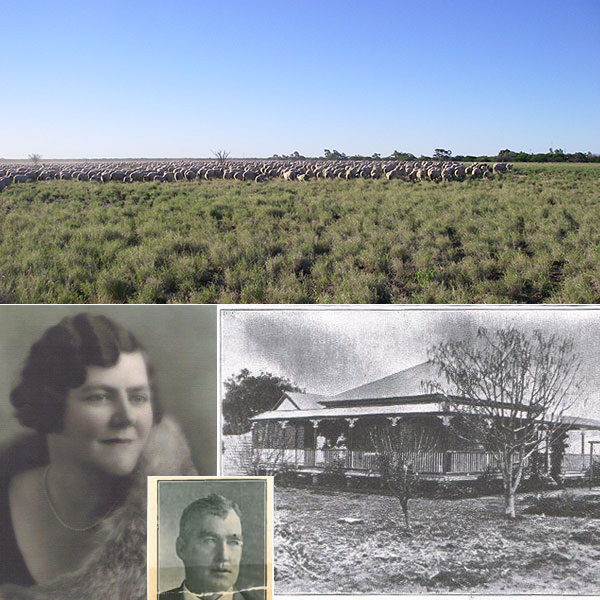 One of the best properties in that part of Queensland state. For Bea it was the start of many tragedies and strife. These were good times in this country, though elsewhere WWI was hell. Was put in tins marked bully beef on which the troops dined every day. The Abbotts prospered, life was good until that fateful day. Bea was left to cope alone with little help to run the place. To cope with life's tragedies as she had done before. Keith Walker was a handsome man who quite soon turned her head. Then he met Pat, his lifelong mate, to whom he soon was wed.
To map and survey battle sites where so many met their fates. Then moved several times as the family grew apace. Bought a house in Redcliffe and that's when Keith retired. And together they did travel, overseas and interstate. Live lives that city children would rarely know or see. A thunderstorm the culprit, the tragedy deplored. As herstory repeated the life Bea and Dot survived. Now they carry on traditions and live the Abbott dream. To fulfill the ancient journey of a breed that's not gone wrong. Tables were spread with red and white cloths, but luckily, no lace. Helpers came from the town, the alcohol flowed, the food was just right. To test the fortitude of the outback folk; may their optimism never wain.